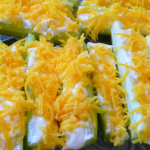 This super simple stuffed celery is a guilt-free appetizers/snacks! Stuffed with cream cheese, carrot and seasonings, everyone will surely love this recipe. In a small bowl, combine cream cheese, carrot and seasonings, fill celery pieces with cream cheese mixture. Cover and chill for at least one hour.